OnePlus is all set to launch the successor of OnePlus 3T this summer. The speculations about the confirmation with the recent teaser from the company. A few days ago, OnePlus CEO, Lau Pete said that the company is working very hard on the next flagship phone, which is the OnePlus 5 and has really high expectations from the device. Recently sketches of the device have also been leaked online, which confirms the coming on dual cameras. Not to forget, India Today Tech a few days ago also confirmed the coming of dual cameras for the upcoming OnePlus 5, and that's what exactly the company is coming up with. OnePlus has already started teasing about the upcoming flagship aka OnePlus 5. The smartphone manufacturer on Monday shares a photo on Weibo, which says, "Hey Summer! Give me five!" 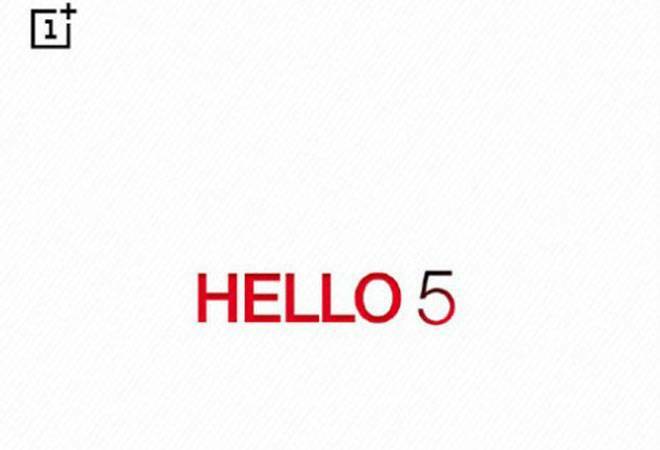 Along with the post, OnePlus also added an image which says: Hello 5. Not only that, the flagship phone has been subjected to several leaks and speculations in the past few days. OnePlus has confirmed the launch time frame and the name in a statement which states, "OnePlus, a global start-up challenging conventional concepts of technology, confirms that the next flagship smartphone will arrive this summer and it will be called OnePlus 5. The OnePlus 5 will be the successor to the OnePlus 3 and 3T. The name OnePlus 5 has been inspired by former NBA player Robert Horry, who has a huge fan-following among OnePlus staff members. OnePlus's Shenzhen office sports two Robert Horry's paintings and his number five jersey inspired the smartphone's name." On the specifications front, OnePlus 5 is expected to feature the Snapdragon 835 processor, 6GB RAM though some reports claim the company will add 8GB RAM to this phone. The other highlight will be the dual rear camera setup, and some leaks claim at 23MP rear camera might be on the cards, but that looks unlikely. Leaked sample of images from OnePlus 5 was also shared on Weibo earlier. OnePlus 5 will likely feature a bigger 3600 mAh battery, coupled with Dash Charge 2.0, according to reports. For those looking to buy a OnePlus smartphone, remember that a ‘summer launch’ means OnePlus 5 could be out in India by July or early August. The OnePlus 3T prices might drop just ahead of the new phone’s launch, so it is best to wait if you are planning to get a new device.